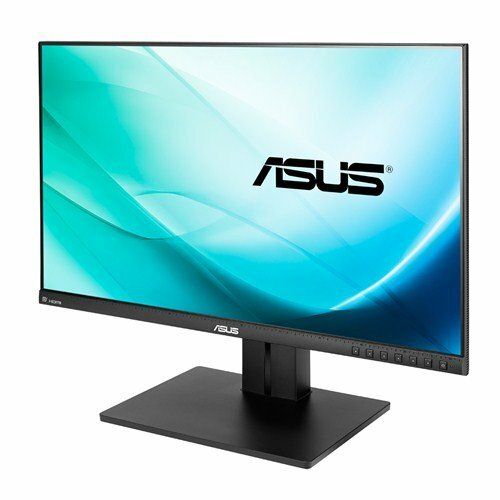 Asus PB298Q is a 29-inch computer monitor with tons of admirable qualities and features. It’s not made for those who desire the biggest screen or the highest refresh rates. The PB298Q is made for those wanting a good and dependable 29-inch ultrawide monitor that does well for gaming, working, and watching movies alike. Is it really good for all three purposes? Read on to find out. The PB298Q sports a 29-inch IPS panel with 21:9 aspect ratio on 2560×1080 resolution. The IPS panel has 178 degrees of viewing angle and covers 98.7% of the sRGB color gamut which is a tad below the claimed 100%. This monitor measures 27.6 x 14.8 x 8.6-inches and weighs 18.7 pounds. The mount interface for the stand is a 100x100mm VESA standard that fits a wide range of aftermarket monitor arms. The ASUS PB298Q has sufficient amount of ports at the back to cover the need of most people. All of them facing backward and easily accessible. The available ports are 1x DisplayPort 1.2, 1x Dual-link DVI, 1x HDMI 1.4, 1x Audio In, and 1x Earphone jack. ASUS didn’t put any USB port on the PB298Q. Not a big deal if you’re not the type who love plugging in their flash drive to play the movies stored in it. There’s a pair of speakers integrated into the monitor, 3 Watts each. This monitor draws 55-Watt of power when turned on but dwindles down to 31-Watt during normal operation. It’s certainly not power-hungry enough to cause a bump on your power bill. ASUS keeps everything simple yet stylish with this monitor. The top and side bezels are 0.8-inches thin. Not quite borderless, but pretty close. All the control buttons are located on the right-hand part of the bottom bezel. It’s a nice design that lets you know which button you press. The seven control buttons are QuickFit, Preset, Volume/Down, Menu, Brightness/Up, Input Select, and Power button. Measuring 27.6 x 14.8 x 8.6-inches, the PB298Q is way smaller than a 34-inch ultrawide monitor. The size makes it ideal for those who want to try the ultrawide experience but the kind of desk space that a 34-inch monitor will take. The stand is something to behold. It’s made of heavy-duty steel. Considering that the monitor weighs only 8.5 kg or 18.7 pounds, choosing steel as the material is certainly a bit excessive. Of course, it’s much better than plastic stands you can find these days. The stand is sturdy and keeps the monitor stable even when you deliberately nudge it a bit. The base is huge which contributes a lot to its stability. There’s a bit of plastic at the back of the stand that helps you with managing the cables. It snaps on and off easily. Adjustability is one thing the stand is not lacking in. You can adjust the monitor’s height up to 150mm or about six inches; swivel it left and right by 60 degrees; tilt it up and down 20 degrees and 5 degrees respectively. Finally, it has 90 degrees pivot adjustment. All four adjustment can be made smoothly without any jaggy movement. With this kind of versatility, you can have the most comfortable viewing position without having to buy an expensive wall-mounting solution. Keep in mind that this is a super wide monitor. To pivot the display 90 degrees, you need to adjust the height all the way up first. The big deal about the pivot adjustment is that you can rotate the monitor from landscape to portrait. Since the PB298Q uses IPS panel, using it on portrait does not have any detrimental effect on viewing angle. We can’t comment on how often you’re going to use the monitor on this setup. Working on a large spreadsheet is certainly going to be a pain in the rear on portrait. For reviewing documents, however, portrait is excellent especially when you want to print the document on legal size paper. Surfing the web with the monitor on portrait also gives a different browsing experience. You should try it even just once. Who knows, maybe you’ll enjoy browsing better that way. Even when you can’t think of any uses for pivoting the monitor now, at least you don’t have to get a monitor arm just to rotate it should the need arise. As with monitors, the first thing you need to do when this monitor arrive is to connect the stand to the monitor. You’ll be glad to know that this is a straightforward process. You just work on four screws, and you’re done. That’s all. With the choice of HDMI, DisplayPort, and DVI, the ASUS PB298Q works well with different types of PC, laptop, Mac, and Chromebox. It’s nice that ASUS doesn’t ditch DVI (Digital Visual Interface) from the PB298Q. With the Dual-link DVI port on board, your old game console or set top box with no HDMI or DisplayPort can still use this monitor without any problem. Since ASUS has conveniently included all the necessary connectivity cables in the box, you do not need to buy cables separately to complete the setup. The only exception is for Mac users who should get an active Mini DisplayPort to DisplayPort cable to hook up their system. The Thunderbolt port found on Macs are basically the same as Mini DisplayPort. Using such cable, Mac users can fully utilize the 60Hz refresh rate of this monitor. Do keep in mind that running a 29-inch display on 2560×1080 resolution @60Hz does not require the latest nor most powerful hardware. One valid reason for upgrading is if the graphic card doesn’t have DisplayPort. There’s a significant difference between running this monitor at 30Hz with HDMI and 60Hz with DisplayPort; Everything is more fluid at 60Hz. A mid-end card such as a GTX 770 is enough to run the monitor to its fullest potential. You don’t even have to overclock it. Once you get all the cables plugged in, and the monitor turned on, the next step is to play with the picture settings. With the buttons located at the front, you can clearly see which button you push without any guess works. Weirdly, the function of each button changes depending on which sub-menu you pick. The Brightness and Volume buttons also act as Up and Down button. It’s still fairly easy to use, but for those who expect consistency, it might be confusing at first. It’s a good thing that most people will only need to play with the settings one time. Out of the box, images are sharp with accurate colors and deep contrast. Texts are looking good regardless of the font size. The only setting you may want to change is the brightness. The factory setting is a bit too high. At 92% brightness, it’s too much for a not so well-lit room. You may want to lower it down a couple of notches. Viewing angle on the PB298Q is as good as you can expect from an IPS panel. Each part of the screen looks uniform without any drop of sharpness or brightness when you view the screen at an angle. If you pay attention to the corners, you can see some backlight glow there. This is common for a monitor with IPS panel. It’s not something that you’ll consciously notice on daily use. The yellowish glow may be noticeable when you watch movies or play games with very dark scenes. Since ASUS markets the PB298Q as a commercial monitor, its focus is on increasing productivity. It so happens that an ultrawide monitor is excellent for multitasking. A 29-inch ultrawide provides the same screen real estate as two 17-inch monitors with 5:4 aspect ratio each. You can open two applications side by side, eliminating the need for a two monitor setup. People who do a lot of video and photo editing will appreciate the amount of space this monitor has. The ASUS PB298Q is not only superb for work-related stuff. It is also perfect for gaming. The 60Hz refresh rate and the 5ms response rate is more than adequate to cover whatever games you’re playing. It’s swift with no noticeable input lag. The high contrast allows you to see fine details in shadows and dark textures. The wide field of view is an excellent feature for FPS and racing games. You won’t see any screen tearing or ghosting when playing fast-paced games. There are already many games supporting ultrawide format natively. Games that don’t support it natively can be scaled to 2560×1080 from the game settings or tinkering with the configuration file. Playing games like Battlefield 4, Far Cry 3, Crysis 3, Borderlands 2, Bioshock, GTA V or Dirt 3 on ultrawide really gives you a new sensation. It sure beats having two 17-inch monitors with bezels smack dab in the middle. In the future, you can be sure more and more games will have native support for ultrawide aspect ratio. It makes gaming more immersive and enjoyable than the “old” 16:9. We won’t be surprised if ultrawide is set by gamers to be the new standard soon. As for watching movies, well you can say that it makes a lot of sense to watch movies on ultrawide format. Why? Because 21:9 is close to what cinema screen uses these days. And just like gaming, the level of immersion is high when watching movies on the PB298Q. As more movies and shows available in ultrawide, nobody will want to go back to 16:9. If you enjoy Netflix, you may want to download one Chrome extension called Ultrawide Display Aspect Ratio for Netflix. For 16:9 content, this extension will crop the top and bottom part so you can watch the movie without black bars on the sides. It also let you fill your whole ultrawide screen with 21:9 content without any letterboxing effect. This monitor has six presets — Scenery, Standard, Theater, Game, Night View, and sRGB. Since the picture quality is already splendid from the get go, you can leave them as they are. Of course, we can’t stop you from playing with those presets. After all, different people have different tastes. Some people like it more when the pictures are more saturated, and that’s okay. It’s your monitor, and you are free to tune it as you please. If your work involves tons of writing and printing documents, the ASUS PB298Q has one nifty feature that lets you view the actual size of the documents you’re working on. It is called QuickFit Virtual Scale. It shows an overlay on the screen that displays the actual size of the paper. Since this monitor can be rotated to portrait, this handy feature works with whatever page orientation you set on your documents. ASUS’ Flicker-free technology is another feature that office workers appreciate greatly. Working on this monitor 9-to-5 won’t strain your vision. Same thing when you’re streaming movies for hours on end to catch up with the latest series. This monitor is really easy on your eyes whether you use to for work, games, or watching movies. Available for download is ASUS MultiFrame software that you can use to set multiple windows on separate parts of the screen. If you’re curious on how the Multi-Frame software arranges the windows and if it suits your needs, feel free to download and play with it. With the software installed, you have extra menus on the top right corner of any application window where the Minimize, Restore, and Close buttons are. You just click the menu to set and send the window to any corner, resizing them perfectly with a single click. We prefer using the combination of Windows and left/right arrow keys when we only have two windows open. It’s already stupidly easy to set them evenly side by side on the screen. However, we can see the appeal of this software for people who need to have more than two windows open at a time. This monitor does provide so much screen space that opening four windows, one at each corner, doesn’t feel cluttered at all. Not all feature in the ASUS PB298Q is that good, though. The speakers certainly lack any redeeming qualities. They’re only 3-Watt which is borderline useless. Maybe they’ll do for watching YouTube videos, but other than that, just go with a dedicated sound system. You can also go with a sound bar if you prefer having a non-cluttered desk. It will still be a significant improvement over the pathetic speakers on the PB298Q.